Our meeting place is also the first night's camp. 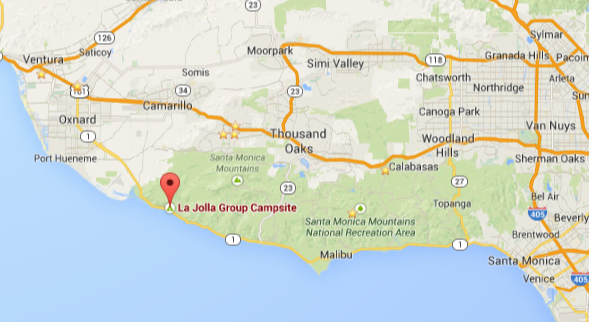 On May 2th, we will meet at the La Jolla Canyon Group Campground in Point Mugu State Park. Plan to arrive between 2:00 P.M. and 4:00 P.M. Come early enough to set up your camp and do a vehicle shuttle to the parking area a few miles away. We will have dinner & orientation at 6:00 P.M. after shuttling vehicles to the secured parking area. 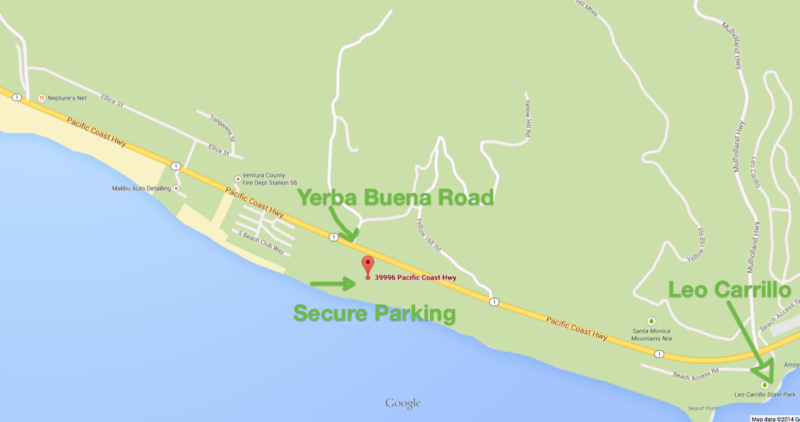 From the South - There are several ways to access Highway 1 (Pacific Coast Highway) coming from the South. Heading North on Pacific Coast Highway, La Jolla Canyon is on your right - just over a mile past Sycamore Cove beach and Sycamore Canyon Campground. Drop Off Suggestions - If you are being dropped off at La Jolla Canyon, your pickup at the end of the hike can be either at Will Rogers State Historic Park or at the secure parking area, at 39996 Pacific Coast Highway (one mile north of Leo Carrillo State Park). The planned arrival at Will Rogers is about 2 - 2:30 P.M. on May 9th, at which time we will have our farewell lunch until 3:30 or so. After lunch, we will have a van shuttle to the secure parking area where you will meet up with your camping gear and vehicles by about 4:30 P.M. Your pickup driver is welcome to take part in the farewell lunch at Will Rogers State historic Park.